Physical Fence Required: YES. No chain link. Must be wood, 6 foot. He escapes VERY easily from a fenced yard and must be leashed outdoors at all times. Please consider sponsoring Tucker to help with his medical bills. Full bio (updated May 11): Please meet Tucker! 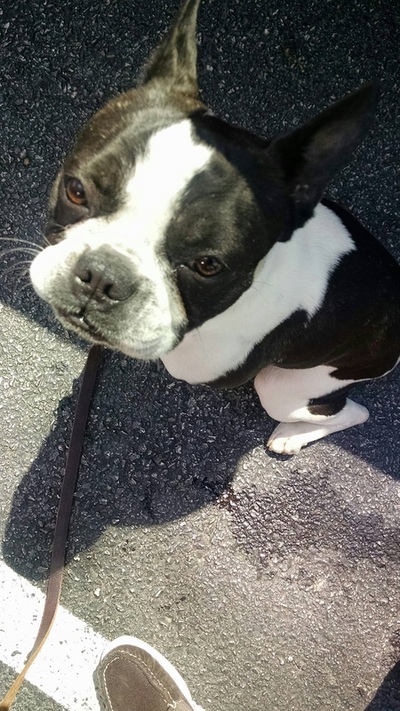 He is a 1 ½ year old French Bulldog / Boston Terrier mix. 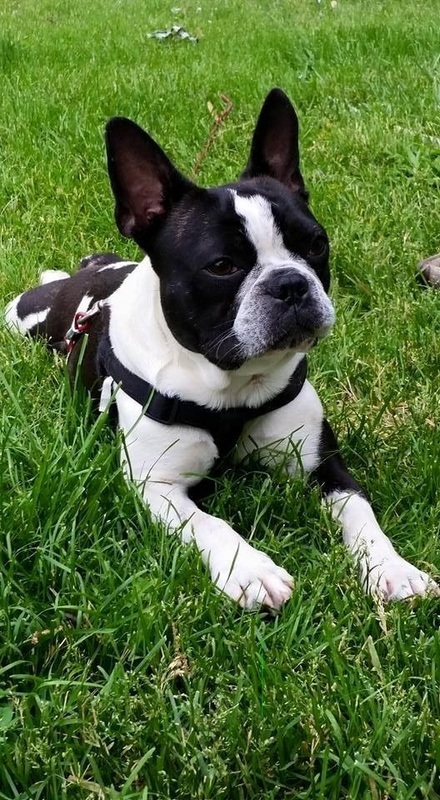 He is black and white with a mostly black face, and weighs about 25 pounds. He came to us as an owner surrender. Tucker is a very high energy pup, who loves to run and sniff everything. He has also proven to be quite the escape artist when it comes to fences. Tucker will be required to have a fully fenced back yard, preferably a 6 foot wood fence – no chain link… he can climb a chain link fence and get out. He will also need to be leashed at all times when outdoors because he is a runner. When he’s outside, he does love to find things to chew on if you’re not paying attention (like the garden hose nozzle) – but what young dog doesn’t like to have something to chew on? Tucker is a fantastic family dog! He adores all the attention he gets from the kids in the home, and he seems to enjoy their company. Tucker is extremely lovable and loves to be near his people. His foster family has taken him to soccer practice and he did great with everyone… he sat in a chair and watched the kids like he was the 'King' of the field. Tucker seems to enjoy playing with stuffed animals, but doesn’t show much interest in dog toys though. Tucker has not messed with the kids toys, which is great for families with children. Tucker gets very excited in the house which is he is working on, but once he runs around and smells everything he settles down. He does seem to respond to his name fairly well and listen to commands. Tucker will be best in a home where he can be loved by everyone and be the only dog in the house since he has some aggression towards other dogs. He is house trained, neutered, and up to date on his shots. All in all Tucker will be a great catch for his furever family! Intake info: Please meet Tucker! 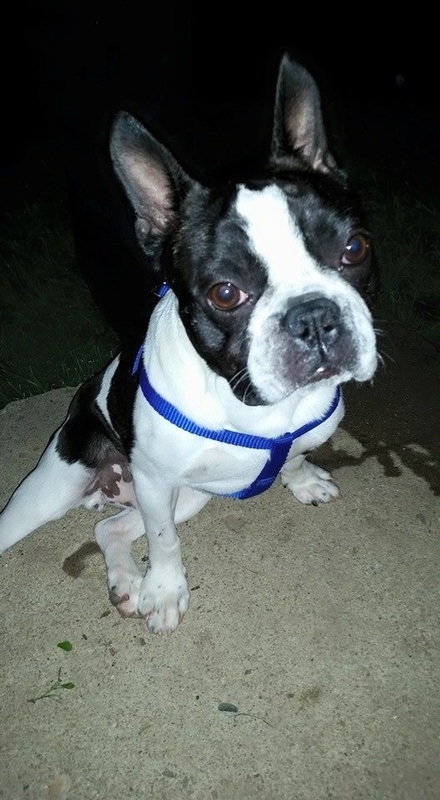 He was surrender with another Frenchie/Boston mix, although they do not appear to be bonded. They will be seeing our vet and then going to separate foster homes. Please check back for updates as we get to know him better.